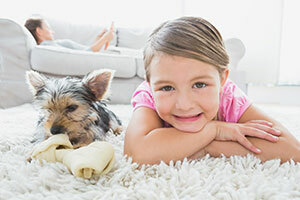 Not all carpet cleaning companies are created equal. If you’ve ever done a search for a carpet cleaning company in Louisville, Lexington, or Cincinnati, you understand that there are about 300 carpet cleaning companies that pop up in your search results. A very good reason for this is that if you want to start a carpet cleaning company, there are no mandatory prerequisites like obtaining an Institute of Inspection Cleaning and Restoration Certification (IICRC). Anyone with a Rug Doctor and a vehicle could start their very own carpet cleaning business, and they do. Trust me. I’ve seen some pretty outrageous things in my 18 years in the carpet cleaning industry. So how do you know what to look for? Let’s start with your needs. Most people pick up the phone and start calling different carpet cleaning companies to compare prices. Yep, right off the bat they want to know how much it will cost to have their carpets cleaned. There is a very good reason why most people do this. They simply don’t know what else to ask. They don’t deal with these types of issues on a daily basis. If you call a carpet cleaning company and they seem rushed or act as if you are inconveniencing them by calling, hang up. If they blurt out a price and want to know when you want to schedule your appointment, run for the hills! When you call The Carpet Chemist, we answer the phones with an attitude of gratitude. We will ask you a few questions about the type of carpet you have, the approximate age of the carpet, what kinds of soils, spills, and other areas of concern you might have, and explain in detail how we are able to remedy these issues. Our technicians will even give you a few DIY tips and tricks on how to address these issues should they arise again in the future. Be honest. We know it can be embarrassing calling a complete stranger and telling them how your little Shnookums tinkled on your favorite Persian rug or living room carpet. It’s ok. This is what we live for! The more information you can tell us, the more we will be able to help you. Even if you aren’t able to pinpoint the exact location of the smell, we have highly sophisticated equipment that can pinpoint it for you. Stains that are not visible to the human eye are detected under our high intensity ultraviolet lights. Our moisture meters will alert us when they detect urine salts in your carpet as well. You see, there really is a method to the madness, and any time we get a chance to play with our highly sophisticated carpet-nerdy gizmos and gadgets, it’s a great day! If you have questions about our red stain removal process, pet stain and odor elimination, candle wax spills, fingernail polish stains on your carpet, or any other imperfections, we’d love to chat with you. We won’t make you feel rushed or bothersome. We just want to help you get your carpet looking its absolute best. We appreciate you taking your valuable time to read our blog. Please let us know if you have any questions or concerns. You’re most certainly welcome. We’re MAD about carpets! We value your feedback so please let us know if you have any other questions about carpet cleaning.